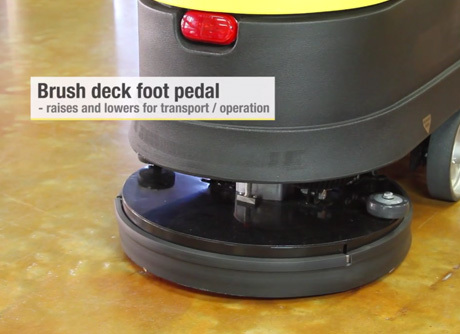 Each of the units in Tornado's® EZ Series of floor scrubbers provide excellent scrubbing results on a wide range of hard floor surfaces including tile, linoleum, cement, epoxy and rubberized surfaces. In a single pass, the EZ Floorkeeper® lays down solution, scrubs and recovers dirty water leaving a clean, dry floor in its wake. Tornado® EZ scrubbers are used worldwide in retail stores, grocery chains, commercial and light industrial applications. The traction units are state of the art featuring all digital controls for ease of use, service and programmability. Units ship complete with our uniquely designed "roll off and run" pallet and delivery system. Order today and begin improving your facility's appearance and labor savings as early as tomorrow! Cleaning Path 20 in. 20 in. 24 in. Waterlift 71 in. 1 in. 1 in. Capacity (Solution / Recovery Tank) 13 gal. / 13 gal. 13 gal. / 13 gal. 13 gal. / 13 gal. Dimensions (L x W x H) 49 in. x 22 in. x 37 in. 49 in. x 22 in. x 37 in. 53 in. x 28 in. x 37 in. Brush Width 20" 20" 24"
Squeegee Width 28" 28" 32"
Brush/Pad Pressure 67 lbs. 65-85 lbs. 72 lbs.